Hi everyone! I’m Arianna, a soon-to-be college student who wants to help teens become entrepreneurs and community leaders by focusing on their finances. That’s one of the reasons I was selected by Boys & Girls Clubs of America and Charles Schwab Foundation as 2018 National Money Matters Ambassadors. 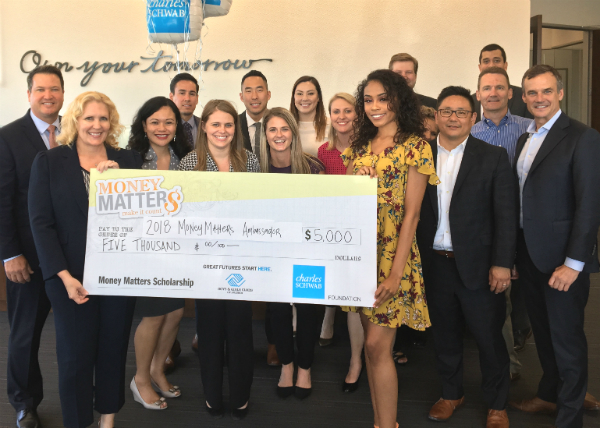 Money Matters is a financial education program available at Boys & Girls Clubs across the country. Sponsored by Charles Schwab Foundation, the program teaches Club teens the basics of personal finance and the importance of being financially responsible from a young age. Money Matters taught me how to prioritize spending, manage budgets and develop healthy financial habits. As Ambassador, I recently traveled to Washington, D.C., to meet one-on-one with senators and representatives. I wanted to shine a light on how programs like Money Matters can support everyone, no matter their age. We discussed how critical it is to promote financial literacy from a young age. For teens just stepping out on their own or starting to think about higher education, knowing how and why to minimize debt is critical. While in Washington, I attended the Jump$tart Coalition's awards dinner. Jump$tart is a partnership of over 100 national organizations (including Schwab Foundation and BGCA) that work to advance financial literacy among preschool through college-age youth. It was encouraging to see so many groups working in collaboration to empower young people to manage their personal finances wisely. Knowing how to handle money empowers you to take charge of your life. Even small steps, like saving 10 percent of each paycheck, can make a big difference. Because money impacts nearly everything. Yet, 1 in 5 U.S. teens lack basic financial literacy skills, the Program for International Student Assessment reports – unchanged since its first survey in 2012. From seeing the MLK Memorial (my favorite part of sightseeing!) to the iconic cherry blossoms all around the city, visiting D.C. was an experience I wouldn’t trade for anything. It was great to meet with lawmakers, and know they are there to listen to and support us. Seeing the work Jump$tart is doing encouraged me to continue speaking out about financial literacy. Because financial freedom can help you have the experiences of a lifetime. I’m thankful for the knowledge I’ve gained through Money Matters. But there’s still a lot more that I, and teens across the country, need to learn.